New England Law | Boston is one of the oldest law schools in New England with famed alumni, as Leonard P. Zakim, a civil rights activist, who embodied the school’s mission of being socially responsible. Inspired by Zakim bridge, a Boston landmark that honors Leonard’s legacy in the community, illustrated the graphic interpretation of the bridge that was incorporated in the shield used in the logo and created the typographic treatment of “New England Law Boston”. The font’s serif mimics a stone cutter’s chisel, giving hints of traditional style, while its clean and straight edges makes it more current reflecting the school’s history of independence and innovation. The Center for Law and Social Responsibility is a program created by New England Law | Boston faculty, where professors, researchers and students collaborate in various social projects. 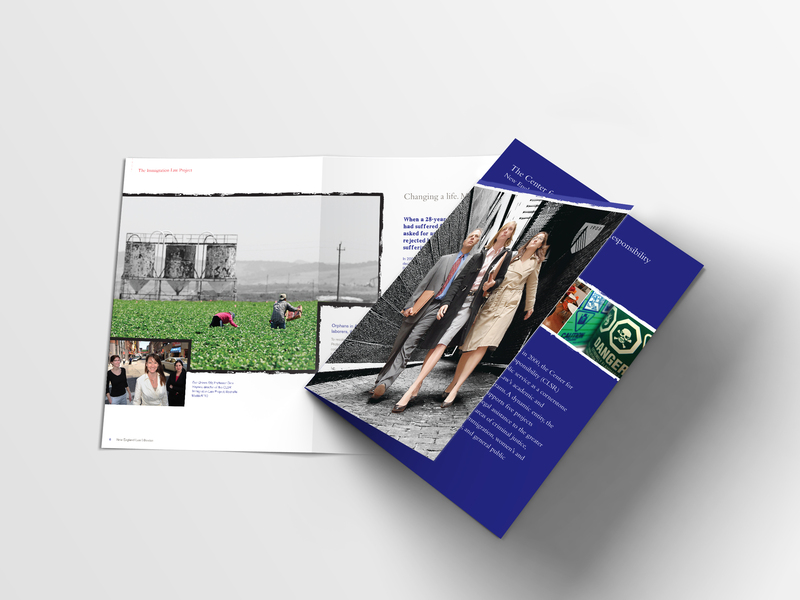 The brochure has an edgier and grittier look to stand out from the rest of the school’s collateral, while still maintaining some design references to its brand. The new look reflects the chance for taking real cases, where students apply what they learn in class in the real world to make a difference in people’s lives.